If you have chronic pain or illness, it can take over your life. Mindfulness offers natural pain management and helps you to improve your overall wellbeing. Our Mindfulness for Health course is for anyone who is looking for relief from chronic pain and the suffering and stress of illness. It has been developed by Breathworks, a leading mindfulness training and development company in the UK. During this 8 week course you will be shown and encouraged to explore a variety of simple practices, which can be incorporated into daily life, helping you to change how you relate to your experience of pain, suffering and stress of illness. How to manage pain and illness in daily life. How to develop an awareness of any patterns/habits you may have developed which are increasing your suffering and help you to change them improving your overall well-being. 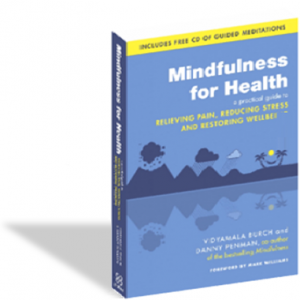 The course is based on the book ‘Mindfulness for Health and Illness’, by Vidyamala Burch and Danny Penman and won the British Medical Association 2014 award for Best Self Help Medicine book. You will be given a copy at the start of the course along with a workbook that you can use to track your progress in. As with any new set of skills practice is essential. In order to gain the full benefits of mindfulness we recommend regular daily practice, therefore we will ask you to do two 10-20 minute meditations each day using the guided meditations provided on USB or CD. Please note this course is not designed for people who are acutely ill or who wish to be passive recipients of support and advice, nor is it a substitute for professional therapy.